An Old Folks Home or a Robot in the Home? As the populations of many developed nations continue to age, their demographics are aging along with the populations. More elderly, fewer young, proportionately speaking. Not only are people having fewer children, but people are also living longer. Within this context, many people around my age are facing, or will soon face, a heart-wrenching decision concerning parents who are finding it difficult or impossible to adequately care for themselves. Even as assisted living facilities become an inevitable choice, researchers are working hard on another option...a robot in the home. While the concept may seem farfetched, it is coming closer to becoming a truly viable option. Researchers at MIT (as reported by Rachel Ross for MIT Technology Review) have built (created?) 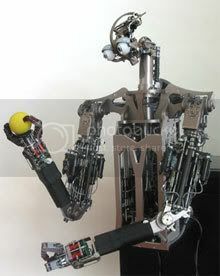 a humanoid robot called Domo who can "size up an object by shaking it in its (his?/her?) hand and then put it away in a cupboard." It's the ability to deal with the unpredictability in the home environment, as opposed to a factory floor for example, that makes Domo's skill so important. Industrial robots deal with predictable objects, whereas the seemingly simple task of putting away the items in a bag of groceries is actually quite complicated by comparison. Rather than programing Domo to deal with objects of specific sizes and shapes, the researchers have equipped Domo to size up each item before deciding how to store it. Domo can also perform basic insertion tasks, such as placing a spoon in a bowl, and help with tidying up the house by carrying around a box in which the human can put clutter. "I can hand it a box of any size, and it can hold it between its two hands, track me, and keep the box nearby," Edsinger says. Domo, which was created for research purposes, will probably never make it onto store shelves--or into anyone's kitchen. But the research that goes into Domo will likely be used by other roboticists in their quest to create the ideal domestic robot. For example, a robot's ability to find the tip of an object is extremely helpful for scientists developing robots that can work with household tools. While some have suggested that a more efficient way to assist the elderly would be to incorporate robots into standard appliances "so that they disappear into the world around you," it seems to me that a humanoid robot would be able to provide for perhaps a more important than putting away groceries. It might provide for the need for companionship. What do you think?